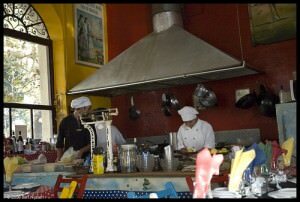 Beep, ‘dos choripanes’, wah wah, HONK, crunch, ‘Che boludo!’ – Buenos Aires is a noisy place. For 24 hours a day, the city is moving, loudly. The gregarious Argentines holler out to each other in the streets, the constant scream of buses – an unimaginably large amount of buses – and taxis honking and crawling the pavements. In fact, someone with way too much time on their hands once measured it as the fourth loudest city in the world (the corner of Santa Fe and Callao is the nosiest part, in case you were wondering). We love Buenos Aires but sometimes an escape from the city is needed. A well-earned dose of quiet. And with the notable exception of a weekend in an Estancia, there’s one place to which porteños, holidaymakers and expats looking to renew their visa on the cheap all head: Colonia, or Colonia del Sacramento to the pedant. Only a short ferry ride across the Rio de la Plata, Colonia is a UNESCO heritage site and makes for a romantic couple of days away from fumes and dripping air-con systems. From the ferry terminal in Retiro, in downtown Buenos Aires, Buquebus (www.buquebus.com) speeds over to Colonia five times a day. Well, only three zoom across in an hour, there are two, cheaper three-hour crossings. But on a nice day, and if you’re staying for more than a day, it’s a pleasant trip. Seacat Colonia (www.seacatcolonia.com) offers a 60 minute ride from Puerto Madero to Colonia, as does Colonia Express (www.coloniaexpress.com). Compared to Retiro, the arrival in Colonia couldn’t be starker. Approaching the town, the whitewashed lighthouse juts out into the Rio de la Plata, the old town walls crumble away enigmatically, and locals on bicycles slowly tread around the town. It’s a serene sight. Conveniently, the port is only a few blocks from the old part of Colonia. And it takes those few blocks to realise some of the differences from the city over the River Plata – those cars are actually stopping for you to cross. Follow Calle (street) Florida down towards the lighthouse, and into the Barrio Histórico, which couldn’t be more charming if Nigel Havers was your tour guide. 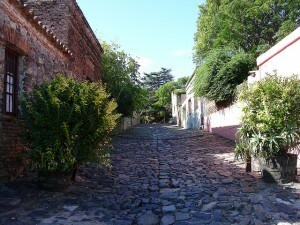 Surrounded by the waters of the Rio de la Plata, Colonia’s name gives away some of its heritage. The Portuguese founded it in 1680, looking for a foothold in South America. Over the next 148 years it flip flopped between the squabbling Portuguese and the Spanish, and was even briefly claimed by Brazil. Then, when Uruguay declared its independence in 1948, Colonia had a permanent home. 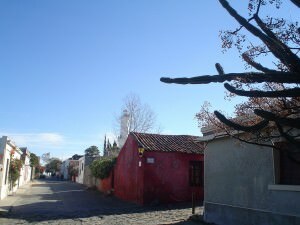 The Barrio Histórico begins at the Portón de Campo, the city gate. Cross the replica drawbridge and into the old city. It’s hard to believe, but 40 years ago, this was a rough part of town. Now, ice-cream stalls, art galleries and gift shops are the first things that strike you. It’s strolling tourists that visit Plaza Mayor, but it was once the bustling heart of the town. Now it’s mainly private houses and the informative Mueso Portugues; not the most enticing display, but it offers a sense of the town’s history nonetheless. Cobbled streets now descend to the sea. The second one on the left is called the Calle de los Suspiros (the Street of Sighs). You may be ahead of me already, but yes, this street was frequented by sailors looking for ladies of the night. The street name is marked by elegant blue and white tiled signs – a sight you will see across Colonia. Some of the faded pink houses are now art galleries. Continue walking towards the still-flashing lighthouse (faro) and underneath is what’s left of the 17th century Convent of San Francisco. Here is also the Casa de Nacarello – one of the loveliest, and most photographed, buildings in Colonia, dating back to the mid 1700s. It’s open to explore. I hope you brought mate, because being in Uruguay it’s compulsory (they won’t let you off the ferry unless you have a huge mate and a flask of hot water under your arm). The views along the rocky coastline are stunning, and it’s where the entire town descends of an evening to drink mate, talk football and watch the sunsets. Walk up Misiones de los Tapes to the Mueso Regional, or more interestingly, to the Pulperia de los Faroles (Misiones de los Tapes 101 and Del Comercio, 598 523 0271) for a beer in this 300-year-old building. There’s live music in the evenings. Take some time to get lost among the cobbled streets. One of the most atmospheric places to have a drink is in El Drugstore; you’ll find it by seeking out the vintage car. It’s a jaunty place with a tapas style menu. Climb up the Avenida General Flores, the main street in Colonia and out of the Barrio Histórico. Along here you’ll find restaurants, souvenir shops, pulperias (taverns) and supermarkets. Given the number of visitors Colonia attracts, there should be a better range of restaurants. There are plenty of costly, mediocre places serving meat or pizza. La Florida, near the Portón de Campo in the Barrio Histórico, uses local seasonal ingredients in an interesting menu. Similarly, lodging in the town is mostly basic B&B accommodation. The best place in the old town is Posada Plaza Mayor (Calle del Comerico 111, 00 598 522 3193, www.posadaplazamayor.com), which although filed under ‘rustic’, has a lovely patio and well-appointed rooms. Also popular is Posada Manuel de Lobo (Ituzaingo 160, 00 598 4522 2463, www.posadamanueldelobo.com), another roughlux proposition that has relaxation high on its agenda. Within a day you’ll have seen everything, but it makes you slow down, sit on the rocks at sunset, drink a beer or two, and forget the clamour of Buenos Aires.